I started my work with a clear goal: I wanted to design a mobile phone that would meet the needs of people who enjoy physical activities like my friends and I do. I divided my work into four themes – mobility, context, modes, and services. Within each theme I gathered empirical data from my user group, either through direct user research or my own observation and analysis, and then used this information to test an aspect of my design idea. Through several rounds exploration and analysis that fed into prototyping and evaluation, I narrowed my focus from a mobile device for active people to solution geared specifically toward recreational runners. My process was very linear, and perhaps could have benefited from more diverse stimulation, but I was very pleased with the foundation that my user research and observation provided. I wanted to create a real-world, usable solution, and I feel that by basing my design on empirical data from my user group I have been able to ground my solution in reality. If I had more time I would like to be able to expand my concept to meet the needs of other active users, including cyclists and gym goers, and create solutions that work across different mobile contexts. I would also like to further explore the service side of my project, including performance-enhancing services for elite runners. Needless to say, I have learned a lot from this experience. Through the course of the year I have been exposed to a number of new techniques for exploring ideas, including role-play, and I have learned how to use sketching and video prototyping to communicate my ideas. A personal goal for this project was to go through the process of three-dimensional prototyping. Working with industrial designers and electronics engineers, I have gained tremendous learning about product development and 3D design, designing and testing electronics circuits, and negotiating between these two sides of the process. With their help, I have learned ways of thinking about interfaces, devices, and the 3D form, and been exposed to numerous prototyping techniques that can used throughout the design process. Finally, I have learned that there is no substitute for trying things out in context. 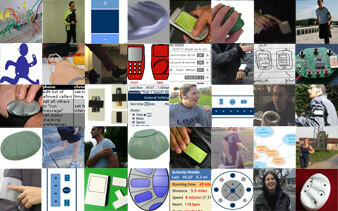 I chose to explore a number of different aspects of interaction design with my project. I wanted to work in the realms of user research, interface design, three-dimensional design, and service design. I have been fortunate enough to touch all of these areas with my design, and to examine the implications of an active context on each of them.